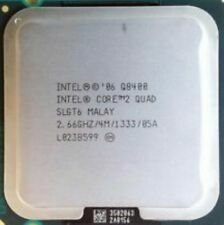 Processor Number Q9400. Sockets Supported LGA775. Processor Base Frequency 2.66 GHz. Instruction Set 64-bit. FSB Parity No. Advanced Technologies. Low Halogen Options Available Yes. # of Processing Die Transistors 456 million. Core 2 Quad Q9550. Core 2 Quad. Thermal Design Power. 0.85V – 1.3625V. MMX, SSE, SSE2, SSE3, SSE4, EM64T. Virtualization Technology Support. Hyper-Threading Support. 64-Bit Support. Processor Number Q9300. Processor Base Frequency 2.50 GHz. CASE 71.4°C. Instruction Set 64-bit. Embedded Options Available No. Advanced Technologies. Low Halogen Options Available Yes. # of Processing Die Transistors 456 million. The CPU Processor has been TESTED and is FULLY FUNCTIONAL. The CPU processor may have scuffs/scratches from normal use and handling. nternationally ~. LOC: frey 42 AE SLB8W. Sale is for processor only. No exceptions. Trending at $25.83eBay determines this price through a machine learned model of the product's sale prices within the last 90 days. CLOCK SPEED 2.5GHz. 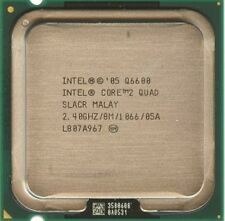 PROCESSOR TYPE Core 2 Quad. BUS SPEED 1333MHz. If you prefer you may also feel free to recycle such materials to any local R2 or e-Stewards certified recycler. Item Specifics. SOCKET TYPE Socket 775. 时钟速度： 2.33 GHz 公交车速度： 1333. 处理器类型： Core 2 Quad 国家/地区： 马来西亚. 英特尔 冷却组件包括： 无/仅处理器. BX80580Q8200 核心数量： 4. 插座类型： 插座T 处理器型号： 英特尔酷睿2四核Q8200. They have been fully tested. The Q9550 clocks in at a base frequency of 2.83GHz, is a Quad-Core, and has an L2 cache of 12MB. These processors will fit the socket type LGA-775. L2/L3 Cache 12MB. Speed 4 (Quad). Product Specifications. L2/L3 Cache. 4 (Quad) 2.8GHz. Product Specifications. None/Processor only. Cooling Components Included. LGA 775/Socket T. Compatible Socket. 1 x QX6700 Processo. Sorry for the inconvenience. Pulled from a workstation, and fully tested. Motherboard support 65nm (E6600, Q6600), need 65nm Xeon 771 CPU. Motherboard support Pentium D / 4, only by pentium D Xeon 50XX series. Motherboard support 45nm (E5200, Q8200), any 771 CPU. We will do our best and help you provide the solution. 1 x Q9550 cpu. We will do our best and help you provide the solution. ETA 2 to 10 Weeks. Picture For Reference Purpose Only. Processor NOT included Item Discription : With this adapter you can install in the majority of the socket 775 motherboards a cheap Quad Core Xeon which is better than an expensive Core 2 Quad ! Each adapter is tested electronically and inspected thoroughly. 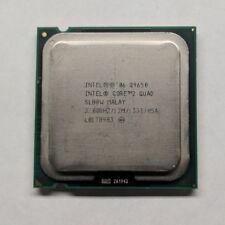 Will fit the Xeon 5400 series (L5410, L5420, L5430, E5410, E5420, E5430, E5440, E5450, X5450, X5460, X5470, etc) LGA771 to make it compatible with most P35, P43, P45, G31, G33 and some others like some 965 chipset motherboards. Will also work for other 771 Xeon, other than 5400 series. Note: . Socket LGA 775. NO PO BOX, FPO, APO. No Hawaii and Puerto Rico. Model : SLB5M. Processor Only. The Q9550 clocks in at a base frequency of 2.83GHz, is a Quad-Core, and has an L2 cache of 12MB. These processors will fit the socket type LGA-775. Product Specifications. None/Processor only. Cooling Components Included.